“I am a survivor of the Guatemala civil war.” In 2004, Laurie Levinger left her home in Vermont for Guatemala where she planned to teach English to Maya university students. But on the first day of class, Levinger became the student instead of the teacher when a young man named Fernando introduced himself by saying “My father was killed when I was four months old. 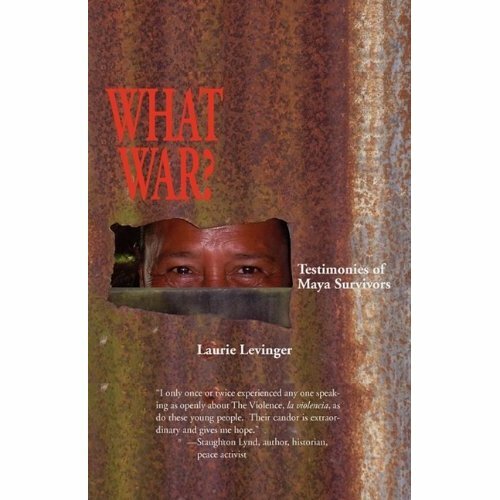 I am a survivor of the Guatemala civil war.” Shocked, Levinger’s first thought was “What war?” Beginning in 1960, fighting between the Guatemalan military and guerrilla fighters raged across this Central American country. By 1980, this violence-which began with a CIA-backed coup and efforts by the United Fruit Company to protect its financial interests-turned into the massacre of Maya people in every corner of Guatemala. By the time peace accords were signed in 1996, over 200,000 Maya people had been murdered, “disappeared”or forced into exile by their own government. Levinger’s students had been young children when these atrocities were committed. Many lost their parents. Many had relatives who “disappeared.” All had suffered the loss of their culture, their family ties, their sense of safety, their personal identities. As a clinical social worker, Levinger believes in the importance of bearing witness, of speaking the unspeakable out loud. After her initial trip,she returned to Guatemala, this time with a tape recorder and a mission: to record the testimonies of her students, to document their enduring love for their Maya culture, and to honor their unflagging search for truth. In What War? Levinger brings us stories, told in the spare and eloquent language of truth-tellers, reminding us all that the true cost of war is borne by the survivors. And so is the hope for peace. Posted on Tuesday, September 8th, 2009 at 6:34 pm. Filed under: Blog, Team Guate Tags: Books	RSS 2.0 feed.